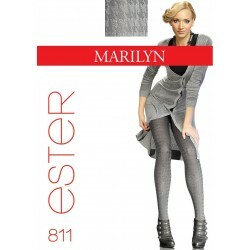 Stivale pantyhose feature a sheer top and dense-colored legs to create a thigh-high imitation. The legs are decorated with a gorgeous pattern that can be worn in front or in the back. The legs are made of tulle fabric and are finished with sandal toes. Another addition to our mock pattern hosiery! Stivale pantyhose from Veneziana features a sheer top and more dense-colored legs to create a thigh-high imitation. The legs are decorated with a gorgeous pattern that can be worn in front or in the back. The legs are made of tulle fabric and are finished with invisible (non-reinforced) toes. Other features include a cotton gusset, flat seams, and a T-band reinforcement along the seams. Beautifuly detailed pantyhose that will be perfect for special occasions.